Night Gallery artist tom Wright talks about the 50th anniversary of Night Gallery, and a remarkable exhibit of his paintings, on display at Mountainview Mausoleum in Alta Dena California, from January 26th through February 10th. In this audio edition of the TV Time Machine, we welcome we welcome artist and director Tom Wright. Mr. Wright was the creator of over 100 paintings for the classic horror TV series, Rod Serling’s Night Gallery. After creating Night Gallery’s frightening canvases, Tom Wright has become one of Hollywood’s top television directors, most notably on the hit TV series, NCIS. Tom Wright’s paintings for Night Gallery, which served as a visual springboard for Rod Serling’s distinctive narrations, were truly the soul of the show. In this special interview, we’ll talk about the 50th anniversary of Night Gallery, and a remarkable exhibit of his paintings, on display at Mountainview Mausoleum in Alta Dena California, from January 26th through February 10th. 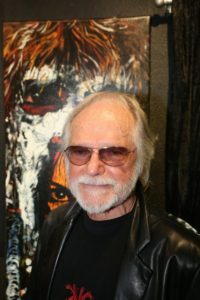 Further on, Tom Wright will describe how special it was to work with the legendary Rod Serling, the artistic process that went into creating his malevolent masterpieces, and how his paintings for Night Gallery became a nationwide phenomenon, ultimately becoming rare, and much sought-after, works of art. So please join us, as we take our own private tour, with artist Tom Wright, through Rod Serling’s Night Gallery.